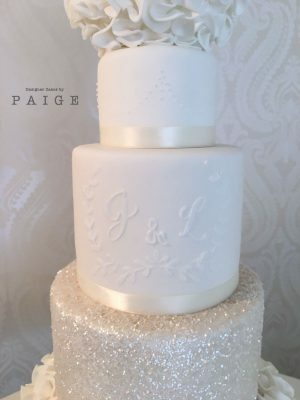 Stunning all white 4 tier wedding cake with petal ruffles, edible glitter, stencilled initials and delicate piping. 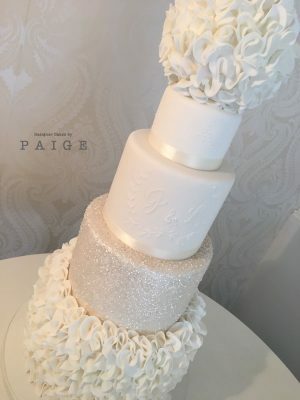 All finished off with a striking ruffle ball cake topper. Call us on 0141 339 4387 to book this design or discuss customisation! 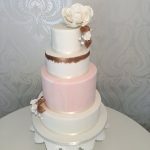 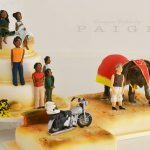 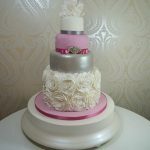 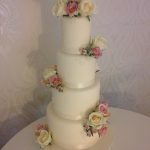 In the West End of Glasgow our talented team of cake decorators create custom cakes for all occasions. Pop into the store or give us a call to talk to one of our friendly girls about all things cake! 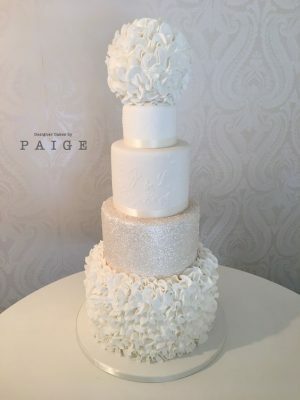 This design features a non-edible top piece made from polystyrene, a standard height 4″ tier and then 6″,8″ and 10″ tiers which are all tall. Call us on 0141 339 4387 to book in for a free consultation and cake tasting where you can start planning your dream cake!